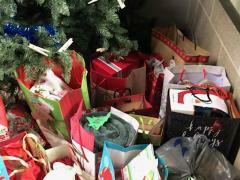 Abington Police and Senior Center's giving tree is bare! Thank you all for generously donating items. 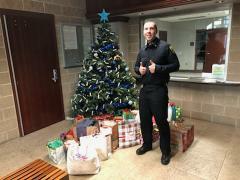 In conjunction with Abington's Senior Center, The Abington Police Department hosted a giving tree in their lobby for the last several weeks. Clothes-pined on the giving tree were unique cut out mitten designs with a local senior's Christmas wish on each one. Over the last few weeks many generous people came in, took an ornamental wish, and filled that wish by buying the item listed on the ornament. 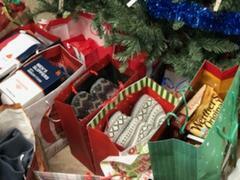 The items purchased will then be disseminated out over the holiday to those seniors who placed the wish. Chief Majenski would like to thank you all for your generous support during this time of the year! Marvel at the pile of gifts and the bare tree with nothing but empty clothespins; what a wonderful sight! Officer Brian Feely is giving "thumbs up" to you all too!!!!! THANK YOU!